The writing in PROTOTYPE is exceptionally well done, going to depths and details not usually seen in this genre of game. 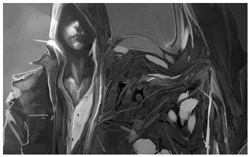 Part of the player’s mission in PROTOTYPE is to collect Web of Intrigue cinematics, which are brief flashes into the back story. Once all of the cinematics are collected, the full story is revealed. I give very high marks to the concept and development of the story line. There are so many possibilities, twists and turns in the PROTOTYPE plot that even if the player is paying close attention, there are still unknown factors which could easily send the story in an entirely different direction. All of these nodes could easily lend itself to a sequel or two, which appears to be the rumour circulating around the web, despite what staffers at Radical say. There are also rumours floating around about possible future downloadable content as well, but again, no firm commitments have been given by either Radical or Activision. As to game play itself, PROTOTYPE is simply fun to play – as long as you like blood, gore, fighting and blowing things up – which I do. Only in a game environment, of course. 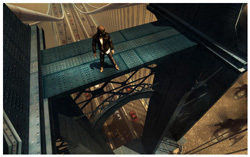 The free world parkour coupled with the many tasks and events the gamer can discover lends itself to hours and hours of play time. Soon after PROTOTYPE’s release, I read on a couple of gamer forums how people had rushed through the game’s mission mode in seventeen hours, and then say they were disappointed with the game. Well, no wonder. Yes, the missions can be completed in a number of hours, but in my opinion, PROTOTYPE’s overall play is anything but disappointing. Another quick note before I go into the game proper – huge kudos to the character, object and environment artists for the quality and scope of their work. Actually, the whole team is to be commended – the technical people for all of the freedom to be gained in a sandbox environment, and for the insane things that can be done in-game. Okay, I will admit that there are a few aspects to the mechanics which can lead to player frustration. At times the controls seem a bit too touchy, and the targeting system doesn’t always grab the nearest or correct enemy – but the targeting system is not psychic, so it doesn’t know precisely what you are trying to target. All it takes is some quick stick-flipping to get to the right target. The only other times I was frustrated, really, was when trying to climb smaller building surfaces and Alex would fling himself around the corner or off the building, or when I just wanted to jump up onto a ledge at the top of a building so I could see what was going on at street level. The only other element which has a tendency to drive me nuts is spotting a Web of Intrigue target, approaching him or her, only to have the target killed at the last second either by Infected or the Military. As the player progresses through the story and plateaus are reached, new abilities and events are unlocked. In most cases, these skills cost a certain amount of experience points, while others require the consuming of certain military types. The unlocked events, which are designed mostly to assist the player in learning new skills or improving control, range from extremely easy to extremely challenging. The glide events were the first ones which I completed at an all-gold level. Consuming scientist events and some of the running events have proven the most challenging for me. However, one of the main reasons I play games is for the challenge, so it’s all good. By now, the uninformed may be wondering what is meant by consuming targets. Well, to put it quite simply, if Alex is collecting Web of Intrigue moments, or consuming Military types for skills or military base entry, he sneaks up behind the target and his viral tentacles lash out and into the target, enabling Alex to become that person, stealing not only the target’s appearance, but their memories and abilities as well. For example, Alex must consume helicopter personnel in order to gain the skills needed to fly a helicopter. In order to gain entry into a Military Base building, Alex must consume a Base Commander. In other instances, Alex can stun and consume Infected characters for health and for specific abilities required in missions. 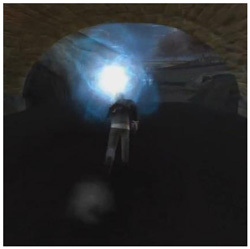 In addition to the above-mentioned benefits of consuming enemies, the persona which you have consumed becomes Alex’s disguise, and as I’ve just noted, it’s sometimes required to gain abilities or entry to places and vehicles, but having that alternate persona also helps Alex evade detection by the Military. Now, sometimes the Military is really stupid, but at other times they detect Alex far too easily. And yes, there is an achievement for completing missions without raising any Military alarms. And yes, I have done it. Sometimes this takes some planning and it’s very important to watch the map – particularly when those nasty tattle-tale Infected detectors are involved – not to mention the Super Soldiers which occur towards the latter parts of the game. This is another area of development which I appreciate – the subtle changes in difficulty encountered within the environment as I progressed through the missions. These increases in enemy types and numbers cause the player to think and plan ahead, and sometimes develop strategies on the fly. This is where knowledge of the playing field comes in very handy. Due to the virus contained within his human form, Alex has the ability to change parts of his body into a wide variety of very cool and damaging weapons. He can encase his entire body in a hardened shell which is very effective in decreasing any damage he may experience through combat. Alex can also change his limbs into lethal cutting blades, huge Hulk-like arms and fists, and then there are the claws, the whip-fist and all consuming tentacles. Mass damage, gotta love it. Alex can also run faster than the Six Million Dollar Man and defy gravity by being able to run straight up the sides of buildings, jump insanely high and then soar through the air with his glide mode. Personally I like running up a building to the top, powering up for a super jump, and then landing in the middle of a street and causing waves of damage and explosions with the equivalent of a power dive. Fun fun. Conversely, once you have gained the ability to hijack weapons, you can cause even more mayhem by running over Military personnel and Infected citizens or monsters with the armoured vehicles – or by blowing them and vehicles up with the projectiles. If you get tired of destroying things at ground level, you can always take to the skies in a helicopter and either blow up other helicopters or just destroy everything on the ground. Helicopters are also great for getting those highly-placed orbs and blowing up infected water wells. They will not, however, allow you to escape the island. Yes, of course I tried – maybe there was an invisible hole to be found in the invisible walls which protect the rest of the city. I think that if I had to pick what my favourite part of the game is, I’d have to say the ability to free roam and cause general mayhem. Earning the skills to run, grab and throw opened up a whole new level of fun for me. There is something which is very satisfying in being able to grab vehicles, building parts, Infected or Military and fling them wherever I want – at buildings, other people, at helicopters. Great for stress relief, with the physics just adding to the fun (and splat) factor. Making use of Alex’s many weapon modes in imaginative ways also add to the level of destruction which can be caused – and anyone who has any grudges against New York City cabs can get their fill of destroying the multitudes of them found on the game’s streets. Personally I think that massive amounts of cab destruction is worthy of a fun achievement. Even attempts at the most futile of accomplishments can lend itself to much fun, such as trying to cross any of the bridges to leave Manhattan Island. At this point in time, it simply can’t be done (maybe in the future?). Those invisible walls are solidly built, but I had fun trying anyway. Radical’s developers have also added glowing orbs which can be collected for experience points. The blue orbs are called Landmarks, and add to your experience. The more you collect, the more they add to the points you need for skills. There are 200 in all – but they don’t all populate the environment right at the start of the game. The red orbs give the player hints and tips on game play, and there are 50 to collect. Some markers do not appear until certain missions are completed, and many of them are very well hidden, meaning that the player needs to scour the city looking for them. There are also achievement points for collecting them all, so if the player wants to gain the achievement, he or she will have to keep an eye out for those glowing orbs. Once the main story missions are completed, New mode is unlocked. What this means is that the player now has the option of starting a new game, but with all of the skills and abilities Alex has gained. This can be very handy for those who want to get the ultimate achievement – making it through the game without getting killed. That one might take me awhile to get – simply because I get distracted with tossing vehicles and causing mayhem and forget to pay attention to my health level. There are times when gaming that I don’t care if my character gets killed, simply because I am having fun with the game and I don’t (usually) take game play too seriously. Here is where Scott would say…”oh really”… because I will do challenges (in the case of PROTOTYPE, events) over and over until I beat the top benchmark for that particular challenge. I like to reach those benchmarks in games – some may be insanely difficult, but beating them allows me to say “yes, I did it” and then I can set about finding who to “kick in the shins” at Radical for making that insanely challenging event. PROTOTYPE is a game which, even if I have collected all of the achievements, defeated all of the events and consumed all of the targets, I will still continue to play – just because it’s fun. No, there aren’t any Co-op or Multi-player modes, but for me that’s not as important as it seems to be to other gamers. Perhaps in future chapters of this franchise some type of Co-op or Multiplayer could be added, as I’ve noted that some online opinions have stated that without those modes a game feels unfinished. While it would open up another level of replayability for PROTOTYPE, I don’t think it’s essential to the game’s success, as evidenced by the fact that PROTOTYPE was the top selling console game in the USA last month, and it rose to the top of the UK charts in its first week of release. I think that the team at Radical deserves a huge congratulations for taking PROTOTYPE from concept to console. Taking a new IP to completion involves many risks, and I think it says a lot for Activision’s confidence in Radical’s ability to continue produce winning titles by allowing its concept to survive the merger with Blizzard. The depth and breadth of PROTOTYPE’s components show how much passion the teams at Radical put into their projects, and I will say it again – congratulations to all of you on what I consider to be an exceptional title. To further celebrate the release of PROTOTYPE, we are giving away a brand new, unopened copy of the game for Xbox 360. This contest will be open only to Canadian gamers, aged 17 years and up. Details coming soon. This entry was posted on Saturday, July 18th, 2009 at 1:14 pm and is filed under Action Adventure, Game Reviews, Mature, New Releases. You can follow any responses to this entry through the RSS 2.0 feed. You can leave a response, or trackback from your own site.